LGMC recently picked up the adult size chemo caps we had in our donation basket and said they are very appreciated. Men's and women's caps are always needed. Thank you to everyone who has been contributing chemo caps, and please keep them coming! 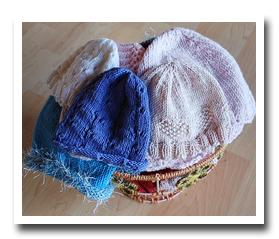 If you are interested in contributing to this great cause, please stop by the shop for advice on the best hat patterns and yarns for these hats.